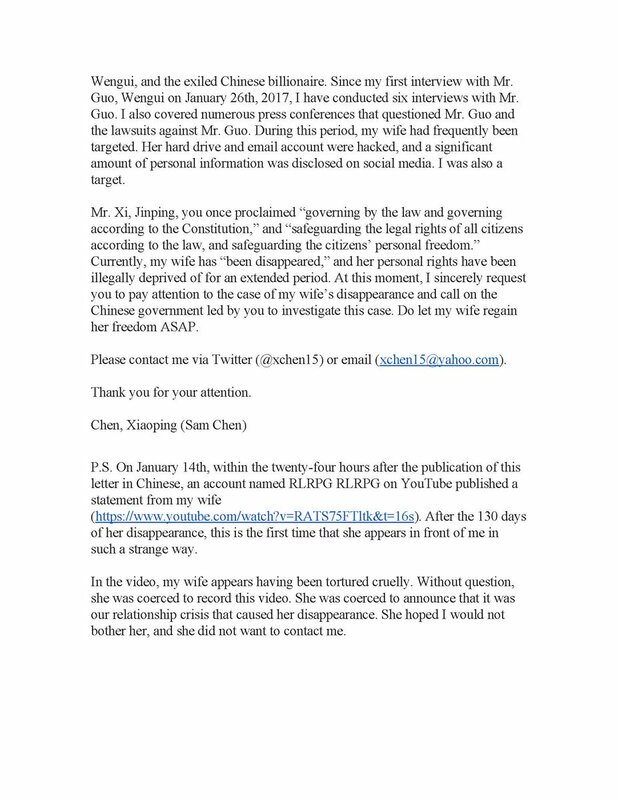 Washington, D.C., January 18, 2018--The Committee to Protect Journalists is concerned about the disappearance of the wife of a critical American-Chinese journalist and today called on police in China to disclose whether they have her in custody. Chen Xiaoping told CPJ that his wife, Li Huaiping, disappeared on September 18 after he carried out a series of interviews with a high-profile government critic. Chen, the New York chief editor of the Chinese-language Mirror Media Group, told CPJ that on January 14, one day after he issued a letter publicly calling on Chinese President Xi Jinping to secure his wife's release, Li appeared in a YouTube video and criticized her husband's activities. Chen said he believes that Chinese authorities are holding Li and that they coerced her into making the statement. Li was taken from her home in Guangzhou city, according to a Radio Free Asia interview with Chen. 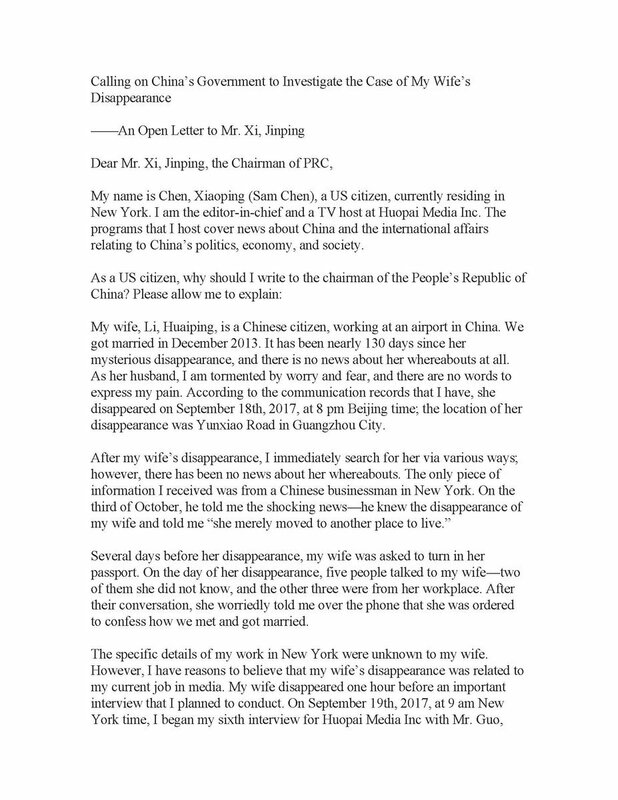 Several days before she disappeared, authorities asked Li, who has permanent residency in the U.S., to hand in her passport, according to Chen's letter to the president. The letter also said that on the day that she went missing, Li texted Chen to say that she was in trouble. "Taking action against the wife of a disfavored journalist would be an especially cruel and manipulative tactic by the Chinese government," said Steven Butler, CPJ's Asia program coordinator. "Chinese authorities should immediately disclose whether they are holding Li Huaiping and why, and refrain from retaliating against Chen Xiaoping or other critical reporters." In the YouTube video, posted under an account named RLRPG RLRPG that carries several attacks on government critics, Li robotically read a statement in which she said that she had cut off contact because of her "feelings," criticized her husband's U.S. activities, and asked him to stay away. CPJ's call to the Guangdong province Public Security Department went unanswered. An officer from the Security Bureau Information Center told CPJ that he had not heard of the case nor Chen or Li's names. "China is a country [that] adheres to the rule of law. If someone is taken away by the police, the family will receive a notice," the officer said. Li's disappearance came immediately before Chen carried out his sixth and final interview with Guo Wengui, a fugitive Chinese billionaire living in New York who has made allegations of corruption and impropriety against China's top leaders, according to news reports. China has accused Guo of many crimes and sought to extradite him, according to reports. The first of Chen's interviews with Guo for the Mirror Media Group ran in January last year. "[The government is] trying to stop me," Chen told CPJ, referring to his reporting. "Even the video released on [January 14] is them trying to stop me." As well as his interviews with Gao, Chen hosts a news program for Mirror Media Group, where he has worked since 2012. The outlet, which was founded in 1991, has five publishing houses, five magazines, and three websites, including news sites that focus on Chinese affairs, according to the company's website. The group has offices in Hong Kong, Taiwan, and the U.S.
Chen told CPJ that he is a naturalized U.S. citizen, who has not returned to China since 1997. He said that although his wife has U.S. residency, she has a job in China and was looking after her mother. Chen added that he has contacted the U.S. Embassy in Beijing and the U.S. State Department for help. China has previously taken action against the relatives of critical journalists, including Liu Xia, the widow of the Nobel Laureate Liu Xiaobo, whose movements have remained tightly controlled even after her husband's death, according to reports. China has also tried and jailed the brothers of Washington D.C.-based Uighur journalist Shohret Hoshur, who works for the U.S.-government funded Radio Free Asia (RFA), according to CPJ research.